McKenzie Brown, a graduating senior at the Greene County Career Center, was recently selected to receive this year’s Greene County Master Gardener College Scholarship award. Brown graduated with honors and has been accepted to attend Wilmington College in the fall. She plans to seek a four year degree studying plants, soils, and subjects relating to the environment and agriculture. While in high school she worked with several state and local organizations and was active with the Greene County 4-H program. Pictured is Master Gardener Jerry Haun presenting the award to Brown at the 2015 Greene County Career Center Senior Recognition Ceremony. McKenzie Brown, a graduating senior at the Greene County Career Center, was recently selected to receive this year’s Greene County Master Gardener College Scholarship award. 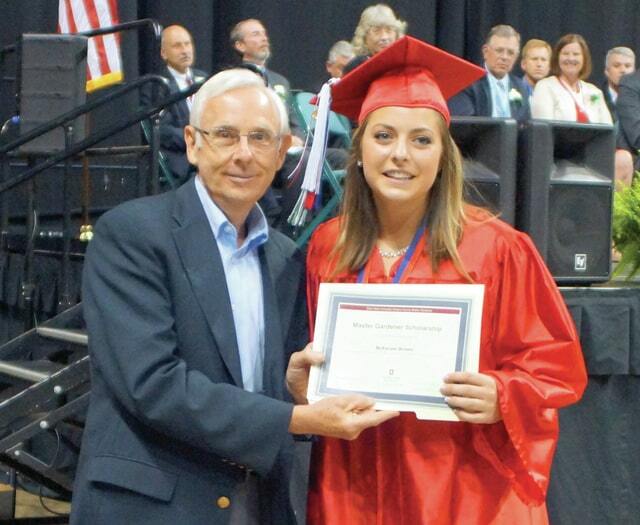 Brown graduated with honors and has been accepted to attend Wilmington College in the fall. She plans to seek a four year degree studying plants, soils, and subjects relating to the environment and agriculture. While in high school she worked with several state and local organizations and was active with the Greene County 4-H program. Pictured is Master Gardener Jerry Haun presenting the award to Brown at the 2015 Greene County Career Center Senior Recognition Ceremony.